A vertically oriented square loop of wire falls from a region where the magnetic field B is horizontal, uniform and perpendicular to the plane of the loop, into a region where the field is zero. Let the length of each side be s and the diameter of the wire be d. The resistivity of the wire is ρR and the density of the wire is ρm. If the loop reaches terminal velocity while its upper segment is still in the magnetic field region, find an expression for the terminal speed. The induce emf ε = -∂flux/∂t, Ohms law, energy conservation. As the loop falls, the flux through the loop changes and an emf is induced in the loop. This causes a current to flow in the loop, and energy is dissipated in the form of heat. If the loop falls with constant velocity, then the rate at which the gravitational potential energy decreases must equal the rate at which heat is generated. |emf| = |dflux/dt| = Bsdy/dt, I = emf/R. Here dy/dt is the speed with which the loop is falling. When terminal speed is reached: I2R = emf2/R = Fvterminal = mgvterminal. The energy dissipated in the wire per unit time equals the gravitational potential energy lost per unit time. (Bsvterminal)2/R = mgvterminal, vterminal = mgR/(Bs)2. R = ρR16s/πd2, m = ρmπd2s, vterminal = 16g ρmρR/B2. A conducting circular loop made of wire of diameter d, resistivity ρ, and mass density ρm is falling from a great height h in a magnetic field with a component Bz = B0(1 + kz), where k is some constant. 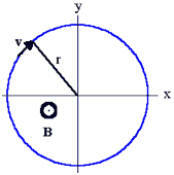 The loop of diameter D is always parallel to the x-y plane. Disregard air resistance, and find the terminal velocity of the loop. The induce emf ε = -∂F/∂t, Ohms law, energy conservation. As the loop falls through the inhomogeneous magnetic field, the flux through the loop changes, and an emf is induced in the loop. This causes a current to flow in the loop, and energy is dissipated in the form of heat. If the loop falls with constant velocity, then the rate at which the gravitational potential energy decreases must equal the rate at which heat is generated. The gravitational force is in the -z direction, Fg = -mg k.
The magnetic flux through the loop is F = BA = B0(1 + kz)πD2/4. The emf induced in the loop is ε = -∂F/∂t = -(B0kπD2/4)dz/dt. The current flowing in the loop is I = |ε|/R. When dz/dt = -vt, (vt = terminal velocity), then I2R = -mg dz/dt = mgvt. Then |ε|2/R = mgvt, [B02k2π2D4/(16R)]vt2 = mgvt, vt = 16mgR/(B02k2π2D4). m = ρmV = ρm(πd2/4)πD. For a wire R = ρ length/area = ρ 4D/d2. vt = 16ρm(πd2/4)πDg(ρ 4D/d2)/(B02k2π2D4) = 16ρmgρ/(B02k2D2). A thin disk of ordinary metal with electrical conductivity σ has radius R and thickness d. It is held fixed in a perpendicular magnetic field B(t)k = (B0 + αt)k where B0 and α are positive constant quantities. In the following, neglect the self inductance of the disk. See the sketch. (a) Find the current density vector j(r) at distance r from the axis of the disk. (b) Determine the energy/time delivered to the disk by the field. What becomes of this energy? (c) Suppose that the constant a becomes negative, i.e., that α --> -α. How do your results in parts (a) and (b) change? Divide the disk into concentric rings. The magnetic flux through the ring is changing with time. This flux change induces an emf. Since the ring has finite resistance, a current flows in the ring. ε(r) = -∂F/∂t = induced emf, ∂F/∂t = (∂B/∂t)пr2 = αпr2. E = αпr2/(2пr) = αr/2. If α is positive, E points into the -φ direction. j = σE, j(r) = σαr/2. (b) The current flowing in the ring with radius r is j(r)*d*dr. The rate at which energy is delivered to the ring is ε(r)*j(r)*d*dr = (dпr3σα2/2)dr.
(dпσα2/2)∫0Rr3dr = dпσα2R4/8. This energy is converted into thermal energy. (c) E and j now point into the φ direction. The power delivered to the disk is the same. A uniform magnetic field B = B0k points in the z-direction. A particle with mass m and charge q moves with kinetic energy E0 in the x-y plane in a circular orbit centered at the origin as shown. At t = 0 the magnetic field strength starts changing slowly, so that at t = t1 it is B = B1k. Neglect radiation. (a) What is the radius of the orbit R0 of the particle for t < 0 in terms of B0, and E0? (b) Assuming that the radius R of the orbit of the particle does not change appreciably while the particle completes one revolution, what is the kinetic energy E1 of the particle at time t1 in terms of B0, B1, and E0? Now assume that the magnetic field stays constant (B = B0k), but that the particle is subject to a drag force Fd = -mv/τ, where τ is a constant. At time t = 0 the position and velocity of the particle are R0 = (0, R0, 0) and v0 = (v0, 0, 0). (c) Write Newton's equations of motion for the velocity components vx, vy, and vz. (d) Construct an equation of motion for z = vx + ivy, and solve it. (e) Find expressions for vx(t), vy(t), x(t), and y(t). Describe the trajectory of the particle in words. A changing magnetic flux induces an emf which changes the kinetic energy of the particle. ΔE = q(dB/dt)πR2 over one revolution. so dE/dt = ΔE/T = (qvR/2)(dB/dt) = (qmv2R/(2mv))(dB/dt) = (1/B)(dB/dt)E.
dE/E = dB/B, ln(E1) = ln(B1E0/B0), E1 = B1E0/B0. (c) Fx = mdvx/dt = qvyB0 - mvx/τ, Fy = mdvy/dt = -qvxB0 - mvy/τ, Fz = 0.
where g = -i[(qB0/m)z - (i/τ). z(t) = z0exp(gt) = z0exp(-t/τ) exp(-iωt), with ω = qB0/m. (e) Re(z(t)) = vx(t) = v0 exp(-t/τ) cos(ωt), Im(z(t)) = vy(t) = -v0exp(-t/τ) sin(ωt). 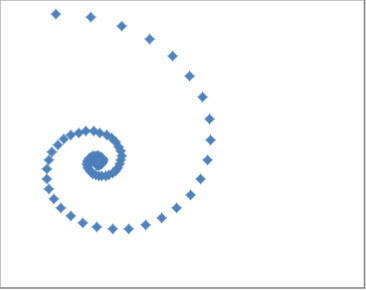 The particle spirals into the point (x∞, y∞). A thin metallic square frame of mass m, electrical resistance R, and side a is rotating about an axis perpendicular to a uniform magnetic field B as shown in the figure. Initially the square frame rotates with a frequency ω0. (a) Determine the average energy loss per cycle due to Joule heating. A changing magnetic flux produces an emf in the frame. The emf causes a current to flow which produces Joule heating. Kinetic energy is converted to thermal energy. The magnetic flux through the frame is Ba2cosθ. The angle is changing, dθ/dt = ω. The induced emf due to this changing flux is -Ba2sinθ ω. The current flowing in the frame is given by I = Ba2sinθ ω/R (neglecting the self inductance of the loop). The amount of kinetic energy converted into thermal energy per unit time is P = B2a4sin2θ ω2/R. Initial average energy loss per cycle due to Joule heating: πω0 B2a4/R.